Having already contributed to the top 10 chemistry blog posts of 2013 over at The Sceptical Chymist, I thought I would highlight my top 10 chemistry publications of the year here. Current trendy chemistry seems to be nano-blah blah and MOFs but I am a flow/organic/process chemist so papers on these themes appear on the list below. 1) The most interesting and exciting publication of the year has to be Fujita’s Nature Article on X-ray analysis using porous complexes. This allows the determination of crystal structures without the need for crystallization of the actual sample molecules. 2) Baran’s Ingenol paper, in one of those luxury journals, was pretty darn impressive! Only 14 steps with cheap starting materials. The man is a legend. 3) As someone that works on catalytic processes, it was great to see Milstein publish an efficient method for the synthesis of carboxylic acids, without the need for stoichiometric amounts of toxic metals. It is always good to see publications describing a new method for a simple but valuable process. 4) You can always rely on MacMillan for a good read. This publication on the one-step synthesis of Plavix was no different. 5) If chemists can find an efficient way of capturing and utilizing CO2, the planet would be much happier. This publication on the Ni-catalysed direct carboxylation of benzyl halides with carbon dioxide is a great example of how we can use carbon dioxide to make synthetically useful building blocks. 6) My favourite fluorine paper of the year was this Science paper on the synthesis of fluorinated natural products using synthetic biology. I always enjoy reading inter-disciplinary work and this was no different. 7) My research is in chiral amine synthesis so this publication on the reduction of amides to amines was immediately appealing to me. The paper describes the reduction of primary, secondary and tertiary amides using a commercially available, air and moisture tolerant non-metal catalyst. Very cool. 8) I am always partial to a flow chemistry paper. Anything from the Ley, Jamison and Seeberger groups is worth reading but this recent overview of how to apply flow chemistry by Seeberger and McQuade really caught my eye. 9) The award for scariest paper of the year (as highlighted over at In the Pipeline) has to go to this work on mercury azides. 10) Interested in sustainable/green chemistry? Then the Sanofi solvent selection guide is one for you. I find OPRD to be a bit hit or miss at times but this is actually a super reference guide. So this is my top 10. What is yours? Use the #chemclub2013 hashtag (sorry for stealing your hashtag, Andrew) on twitter to share your favourite paper of 2013! No need for flashes and bangs! As you may already be aware, I am a proud ScienceGrrl. 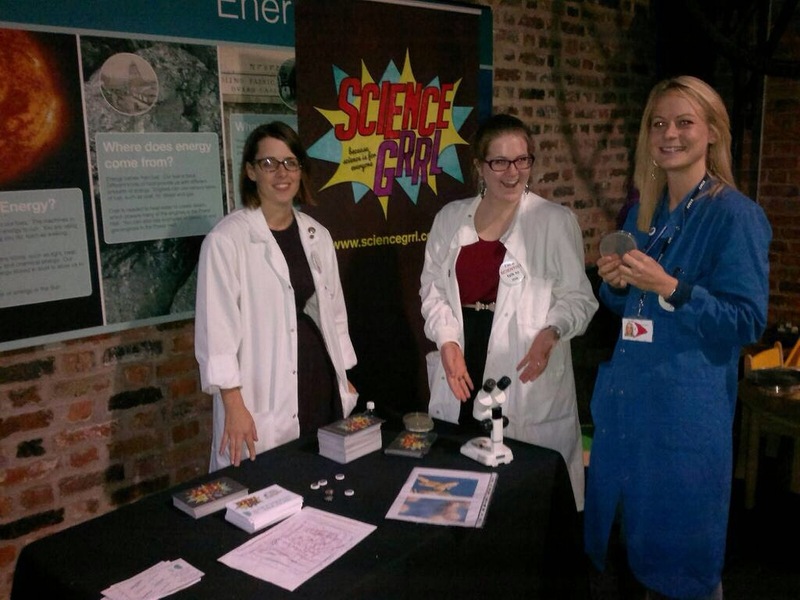 I have a volunteered at a number of events, but most recently at MOSI during Manchester Science Festival. The volunteers all took part in an ‘I’m a Scientist, Talk to me’ event which I have posted about before. It was a great day that involved me walking around the museum and talking to kids and their parents about what I, and other chemists, do for a living. I mainly talked about how I work on methods to make new medicines in a cheaper and more sustainable way. Most kids have taken medicines (typically that yummy banana flavoured antibiotic) and so they know how important they are to everyday life. To some, I even explained that antibiotics were becoming less and less effective and why we really need new ones. I also talked about process scale-up. It was fun seeing kids’ faces look amazed when I described how big plant-scale reactors are compared with lab-scale ones. I love to bake so I used this as an analogy. I compared having to make cakes for the whole population, instead of just for a small family – just imagine the size of that mixing bowl! What was great about the day was how the children and parents were really interested in what chemists (and biologists, mathematicians, archaeologists, geologists etc.) actually do for a living. They didn’t need a full on practical demonstration, just a conversation. They wanted a description of my everyday life and what the point of my job is i.e. how do chemists help the wider world? I was keen to show that chemical reactions are important to modern life from the purification of drinking water to the discovery of new chemotherapies. Recently, there has been some chit chat online about how we need to inspire kids in to chemistry, without flashes and bangs. Dr Mark Lorch has recently written a really interesting piece for the BBC and Prof David Smith has previously written his viewpoint in a Nature Chemistry Commentary. My personal opinion is that we just need to talk to kids and show how important chemistry is, without any of the flashy fuss. We also shouldn’t try to compete with biology and physics, but embrace them as sister sciences and show how collaboration improves science. A few of us tried to demonstrate the importance of this at the ScienceGrrl event. For example, there was another ScienceGrrl who was a microbiologist and her job involves testing drug-type molecules against TB bacteria. Simply put, she is helping to find new cures for TB. We realised that without chemists, she would not have any molecules to test but without microbiologists, chemists wouldn’t know which drug types were effective. We successfully showed, to kids and parents alike, that scientists all need to work together to achieve great things and that chemists are really important, but so are biologists. In conclusion, I think that ScienceGrrl and MOSI do great things to promote science to the masses, in a simple and effective way. I am doing my bit, along with many other fabulous ScienceGrrls, to make sure chemistry sounds fun and interesting to kids. I am already looking forward to the next ‘I am a Scientist, Talk to me’ event so that I can excite even more young minds! So, I have finally gotten around to writing a blog post on the (relatively) new ChemDraw app. Along with many other bloggers, I was given a free download of the app. I was really excited to hear that ChemDraw were bringing out an app. I rarely fire up the laptop at home these days, I usually browse the internet and even watch TV on my iPad, as it is much quicker and easier. The one thing I do always use my laptop for, however, is ChemDraw Ultra 10 as I couldn’t write my reports or blog posts without it. To really test out ChemDraw for iPad, I decided to do my structure drawings for a recent blog post on the iPad only. The structures were drawn and emailed directly from the app (as PNG files) with the images then uploaded directly into the blog post without any further editing. The structures have more white space around them than I’d like, but considering how easy this process was, I think the structures don’t like half bad! Alternatively, I recently took ChemDraw for iPad to a conference (luckily the conference was after the update that included the ability to write notes). I tried to keep notes during the talks with the app, rather than with a simple pen and paper. I was actually rather surprised that I did manage to make detailed notes quickly that were much more legible than those that I could ever write by hand. In summary, I have been pleasantly surprised at how easy ChemDraw for iPad is to use and how quickly structures can be drawn. I will be using it regularly at conferences from now on. As an aside, although I haven’t used it for this purpose, I really think it could be a really fun teaching tool too! I have a lot of favourite chemicals, including caffeine and paracetamol. Lately, though, my favourite chemical has become soft paraffin. Soft paraffin (petroleum jelly or petrolatum) is a non-polar, hydrophobic hydrocarbon mixture. It is not one chemical structure but a mixture of hydrocarbon chains (around 25 carbons in length) with a melting point similar to that of the human body’s temperature. I suffer from excruciatingly itchy legs, mostly in the winter months. It keeps me (and my poor other half) awake at night. I can even draw blood without realising. Various creams keep my itching at bay but what most of these creams/lotions/balms have in common is that they contain soft paraffin. This works by forming a layer that prevents loss of moisture from my skin and also protects my skin from harsh conditions. This stuff saves me from having sleepless nights and scarred legs, so thank you Sir Chesebrough for devising the process of extracting these chemicals from oil (U.S. Patent 127,568) and believing wholeheartedly in your product. Are there any chemists you wish to thank for an amazing or useful discovery? If so, who and why? 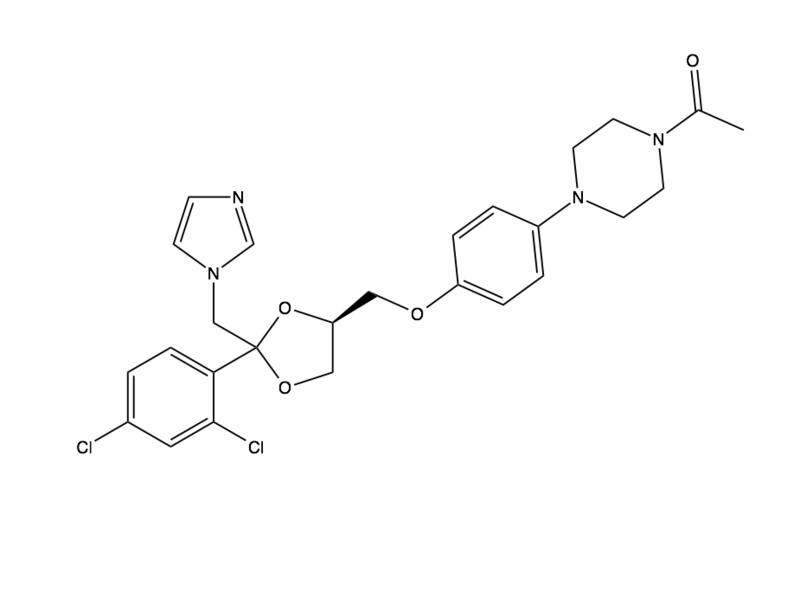 Is it just me, or do all chemists guess the structure of a medicine before they take it? After having a guess, I then Google it and look up the synthesis, where possible. I am currently using Ketoconazole for a skin condition (over-share, sorry). Immediately I knew there was a ketone (keto) and a nitrogen containing heterocycle (azole = five-membered nitrogen ring containing at least one other heteroatom) in there. Conazoles are a common type of fungicide containing an imidazole or triazole ring so that narrowed it down further for me. I could not predict any thing more so looked up the structure (DOI: 10.1021/jm00194a023). It is actually a lot more complex than I expected. 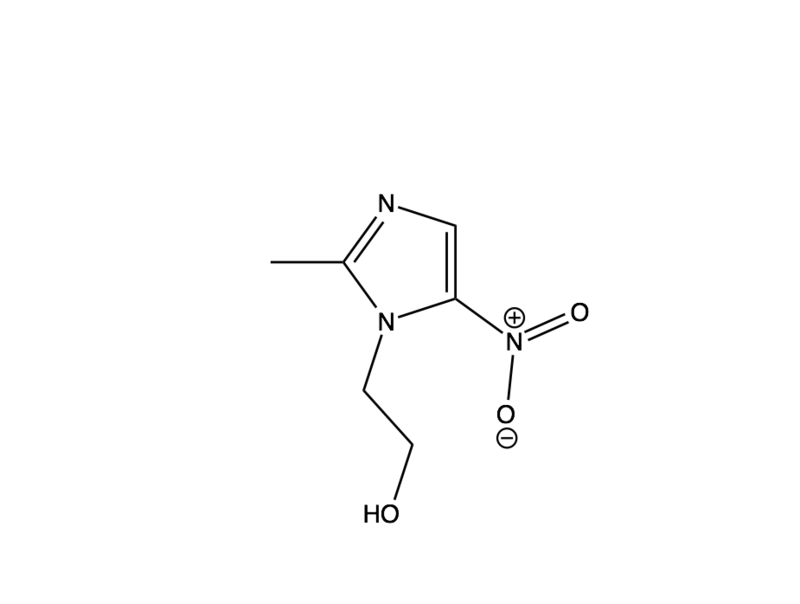 Similarly, a few years ago I took Metronidazole and, as usual, I tried to predict the structure from the name. I guessed there was a nitrogen heterocycle, probably an imidazole ring and possibly nitro group. I wasn’t far off this time! When looking up the structure, I was very surprised by the simplicity of the structure and the synthesis (DOI:10.1007/BF00764821). So, is it just me? Or do you all try and predict aspects of a drug molecule before you take it? Have you ever guessed close to the true structure? If so, share in the comments section below. 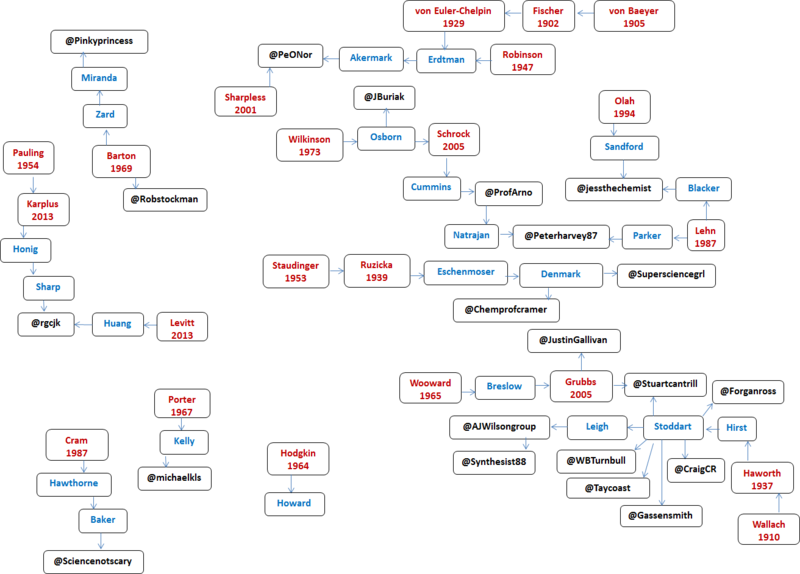 I am a glutton for punishment, so I have decided to compose a new chemistry twitter tree. This tree specifically links chemistry Nobel Laureates with twitter users. There is plenty of space left on the tree. Are you linked to a laureate? If so, how? If you want to be added to the tree, post your connection in the comments section or tweet me. If you need help, then use this Academic Tree as a starting point. If you spot any errors, do let me know.